I believe this is a man’s list. Clues are the shaving foam, newspaper and BBQ items. I could be wrong. 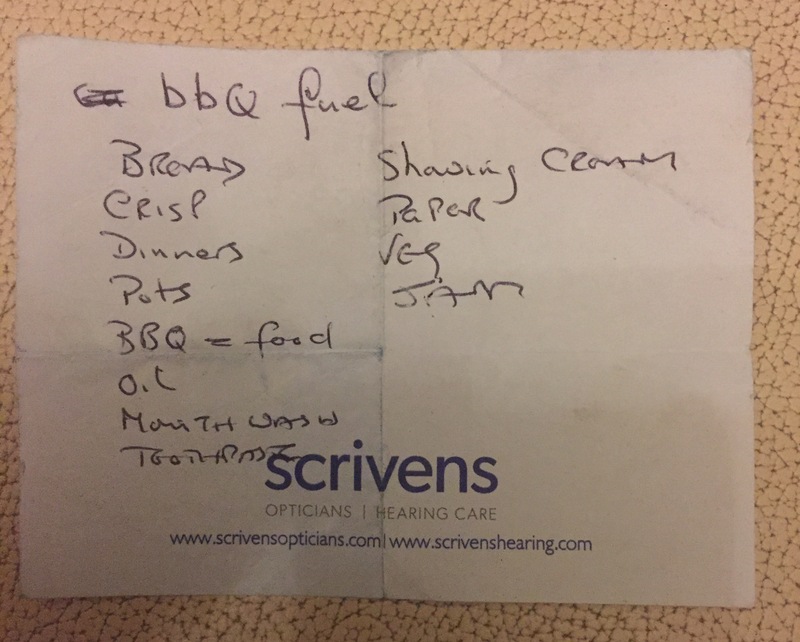 Items are: BBQ fuel, bread, crisp, dinners, pots, BBC = food, oil, mouthwash, toothpaste, shaving cream, paper, veg, jam. Yes, that’s a man who’s possibly preparing to impress a woman with his BBQ skills. He wants to have nice breath and be clean-shaved first. Let me know if you would like to write a guest blog entry here. Your insights would prove popular I think. I can share some lists with you. I’d love to! How do you want to get those lists to me? And thank you! Hi, I have just sent you an invite to be a contributor – let me know if you get it. Agree its a man – interesting the BBQ = food – does this mean he will be going to a barbecue and will be fed or is he going for one of those frozen BBQ mix bags?